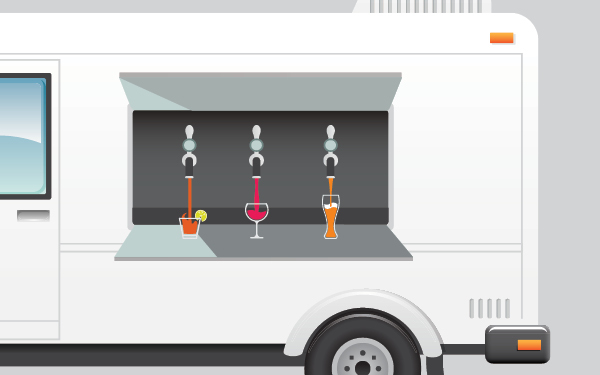 To keep customers in good spirits, beverage companies need their liquor to move quicker. Here's how they keep the drinks flowing. Although wine, beer, and spirits often signal fun and festivities, achieving success in the U.S. liquor market is a serious challenge. The number of products continues to proliferate. Suppliers, distributors, and retailers must comply with myriad regulations, many of which vary by state. One key: a supply chain that offers visibility, facilitates collaboration, leverages technology, and allows sophisticated data analysis. A daunting order, but some companies are bellying up to the bar. That's critical, given the exponentially increasing number of stock-keeping units, or SKUs, one result of the booming number of breweries, distilleries, and wineries. Over the past decade, the number of craft distilleries jumped from about 80 to 800, reports the American Craft Spirits Association. The number of breweries hit 3,464 in 2014, according to the Brewers Association, and each offers its own products. In the late 1990s, in contrast, most warehouses stocked about 150 unique products. "It used to be 'stack 'em high and let 'em fly,'" says David Christman, senior director for state and industry affairs, the National Beer Wholesalers Association. This is no longer the case. A senior logistician once told me if I could understand all the logistics that go into producing a single bottle of beer, I could understand the logistics of any product. Beers that follow Germany's purity laws can contain only water, hops, barley, and yeast. All these natural ingredients must move from where they are grown to the brewery. The inbound logistics of these items must be done with care to preserve the ingredients for use in the finished product, which must then be distributed via complex logistics. Beer and other alcohols are highly regulated and taxed. National and international guidelines, laws, and rules for distribution must be followed to move the product locally, regionally, nationally, or internationally. The farther the beer has to travel, the more complex the transportation and taxation requirements. Beer moves globally because of marketing, prestige, traditions, price, and appeal. Beer not only involves logistics; it is impacted by reverse logistics as well. Ethanol has become a common additive to gasoline. Many critics feel, however, that ethanol is not practical. As demand grows for corn-based ethanol, the price of corn will increase, making it more expensive as a food product. When oil was more than $100 a barrel, corn ethanol seemed like a viable approach because it made a lot of economic sense. Now that oil is less than $50 a barrel, corn does not make much sense as an alternative fuel source. Here is where the reverse logistics of beer comes in. In the process of making beer, the mash of yeasts and other products is removed as a waste product. This material is good for fertilizer and other applications. However, this waste product can be used to produce ethanol. Given that this waste product is not otherwise useful, it makes more sense to turn it into an additive to gasoline. Beer drinkers in New Zealand love this idea and have created Brewtroleum. Several gasoline stations are specifically using this beer by-product as an additive to gasoline. Time will tell if this application catches on in other beer-drinking nations. Who knows, maybe some day we will see Brewtroleum being transported around the world the same way nations today move around oil. Robert Gordon is program director of reverse logistics management at American Public University. Another shift in the liquor market that's poised to impact the supply chain is the growing demand by consumers to know the pedigrees of the products they're purchasing—that is, where they were produced and what ingredients they're made of. Satisfying this demand requires producers and distributors to track distinct items from origin to store shelves. "Consumers want a connection with the product," says Angela Fernandez, vice president of retail grocery and foodservice with GS1 U.S., which is part of global organization GS1, which manages barcode standards. The Global Trade Item Number found under each barcode uniquely identifies products. The use of GS1 standards provides consumers more product information. "Trading partners are leveraging the common language that standards provide to trace products and ensure information transparency throughout the supply chain," Fernandez says. The use of Global Location Numbers identifies the manufacturing plant where a product was produced. "It turns data into a strategic asset," Fernandez says. "It opens a door for sharing information with consumers so they can make informed decisions."